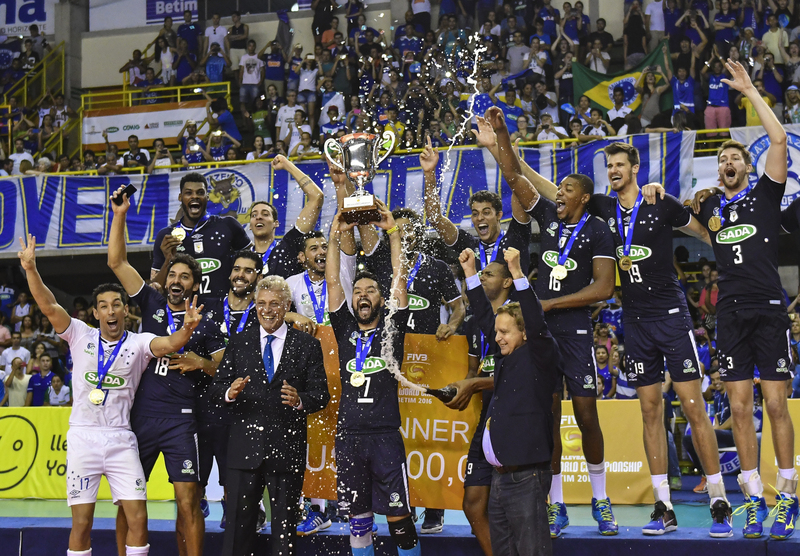 In 2013 Sada Cruzeiro wrote its name in history by winning the unprecedented trophy at the Club World Championship, a milestone for the national sport. The Brazilians were also the first club outside Italy to win the competition. To conquer the most important trophy on the planet, Sada Cruzeiro beat Russia’s Lokomotiv Novosibirsk 3-0 at the final in Betim-MG, in front of 7,000 people who saw part of the sports history being written by the “cruzeirenses”. In 2015 the blue squad was the champion again at home, this time at a final against Russian Zenit Kazan which was defeated 3-1. In 2016 the team, once again, surprised whoever imagined Sada Cruzeiro had already achieved everything, reaching the maximum degree a volleyball team could ever achieve. Unbeaten, Brazilians played the final against the Russian Zenit Kazan again and scored 3 sets to 0 rewriting immortal chapters in the history of the biggest volleyball club of recent times. Sada Cruzeiro also won the silver medal in the World Championship in 2012, in Doha, Qatar, and the bronze medal in the edition played in Poland in 2017.